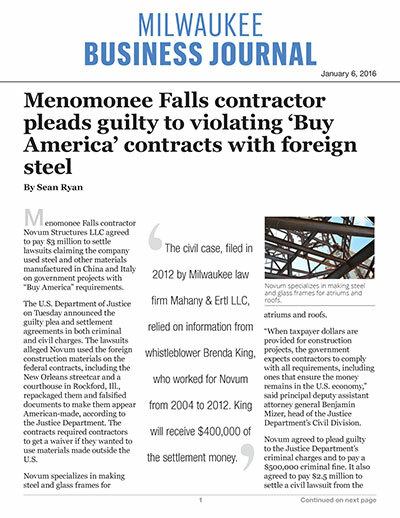 Menomonee Falls contractor Novum Structures LLC agreed to pay $3 million to settle lawsuits claiming the company used steel and other materials manufactured in China and Italy on government projects with “Buy America” requirements. The U.S. Department of Justice on Tuesday announced the guilty plea and settlement agreements in both criminal and civil charges. The lawsuits alleged Novum used the foreign construction materials on the federal contracts, including the New Orleans streetcar and a courthouse in Rockford, Ill., repackaged them and falsified documents to make them appear American-made, according to the Justice Department. The contracts required contractors to get a waiver if they wanted to use materials made outside the U.S. The company specializes in making steel and glass frames for atriums and roofs. “When taxpayer dollars are provided for construction projects, the government expects contractors to comply with all requirements, including ones that ensure the money remains in the U.S. economy,” said principal deputy assistant attorney general Benjamin Mizer, head of the Justice Department’s Civil Division. Novum agreed to plead guilty to the Justice Department’s criminal charges and to pay a $500,000 criminal fine. It also agreed to pay $2.5 million to settle a civil lawsuit from the agency. Novum also will be banned from working on federally funded contracts. Travis Loften, vice president – global finance & US operations at Novum Structures LLC, issued a printed statement Wednesday regarding the settlement. The civil case, filed in 2012 by Milwaukee law firm Mahany & Ertl LLC, relied on information from whistleblower Brenda King, who worked for Novum from 2004 to 2012. King will receive $400,000 of the settlement money. Projects where the violations occurred include the Miami International Center transportation hub near Miami International Airport, the expansion of the New Orleans streetcar system and the U.S. Courthouse in Rockford, Ill. The Miami contracts were worth almost $15 million and covered products Novum delivered in 2011. Novum did its work in Rockford in 2010. Loften noted that there was never an issue with the quality of the materials. The company “in many cases” replaced the foreign materials with others that comply with federal Buy America requirements, he said. The materials that did not comply with the Buy America requirements represented less than 3 percent of the value of work Novum did on the projects, Loften said.